Where is the Best Place in the House to Put a Piano? In order to choose the most suitable place for installing the piano, you need to consult with experts or with the piano tuner. It should be noted that acoustics are influenced, for example, from what material the floor and walls in the room are made, and also what specific fabrics (drapes) and carpets are used in the interior of your apartment or private house. The quality of the sound of a musical instrument depends also on the overall acoustics of the room. 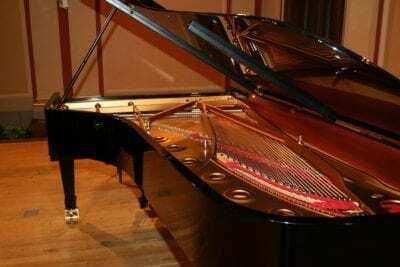 The piano must be set so that the sound from it emanates directly into the room itself. 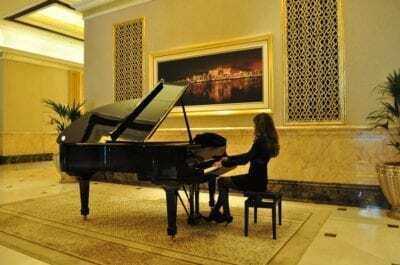 During installation of the piano in a residential building, several very important conditions must be taken into account: first of all, it is the temperature and relative humidity of the air, which should be relatively constant. It would not be entirely correct to strictly limit the temperature and humidity parameters in the room where the piano is located. But it should be noted that their stability is very important. When choosing the place of installation of a musical instrument, it is necessary to remember that the master-tuner you will invite to serve your piano will need freedom of movement. For this purpose, approximately two feet of free space should be left of the keyboard. Many people are interested in the question, where is it best to install your musical instrument taking into account the microclimate. It is important to know that the piano is made primarily of natural, special organic materials. They have undergone the necessary pre-treatment to ensure that the tool has served you as long as possible. The pianos react to fluctuations in humidity and the temperature of the room in which they are located. Constant, significant changes in the microclimate make it just necessary to more frequent, regular maintenance, and in extreme, severe cases can cause irreparable damage to your musical instrument. Pianos can be quite capricious, especially when it comes to taking care of them. Do not install the piano in close proximity to various sources of cold or heat. Under the influence of strong radiators or sunlight, wooden surfaces can fade, and the musical instrument heats up. Insufficiently insulated external walls have a rather negative effect on the microclimate itself, provoking temperature fluctuations and frequent changes in air humidity in a residential area. Keep in mind that the constant air circulation, for example, due to various drafts or due to the full operation of the air conditioner, can very quickly lead to cracking and delamination of the wood. The resonance deck can crack, the felt of the hammers risks being saturated with moisture, because of the influence of temperature fluctuations and humidity, the pegs and the string of the musical instrument can stop holding the system. To inflict all sorts of harm on the piano can also be a direct, insignificant effect of various heat sources. The wooden case will experience additional load, and excessive drying it will cause damage to the tool. For the same reason, try to put it so that direct sunlight falls on it. Try not to move the piano after its final installation – this can adversely affect both its external state and the system. Protect the instrument from impact. Your piano will be upset much faster from blows than from frequent playing on it. Next Next post: Why do We Like to Dance?